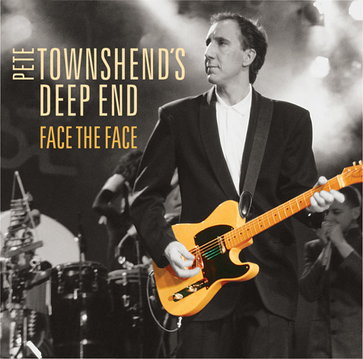 If you aren’t acquainted with Pete Townshend’s Deep End, get ready to be introduced when Eagle Rock Entertainment releases Face The Face as a DVD+CD set / Digital Formats on September 16, 2016 [MSRP $21.98]. This is the first official release of this 1986 show on either DVD or CD format. Pete Townshend’s Deep End featured a diverse and celebrated line-up of musicians. For this show in particular, Townshend is joined by Pink Floyd’s David Gilmour on lead guitar, Simon Phillips on drums (of Toto fame), and percussionist Jody Linscott, along with Peter Hope-Evans (harmonica), Chucho Merchan (bass), John “Rabbit” Bundrick (keyboards), The Kick Horns (Simon Clarke, Roddy Lorimer, Tim Sanders, Pete Beachill &Dave Plews), and backing vocalists: Billy Nicholls, Ian Ellis, Chris Staines, Gina Foster, and Coral Gordan. Pete Townshend leads the pack on guitar and vocals.